Would you like to eat healthier, but does food information dazzle you? Graphic design could help. Eating healthy can help you prevent or manage diseases such as obesity, diabetes and heart disease. A healthy diet is not just about controlling your daily calories. It is just as important that you get enough nutrients, such as fibre and protein. Fibre helps you feel full and is good for your digestion. Protein helps you lose body fat. If you want to eat well and maybe lose weight, choose foods that have a high level of protein and fibre per calorie, such as beans and nuts. Great advice, but how can you pick a healthy option in a restaurant or supermarket when we are in a hurry and maybe a bit overwhelmed by all the options? 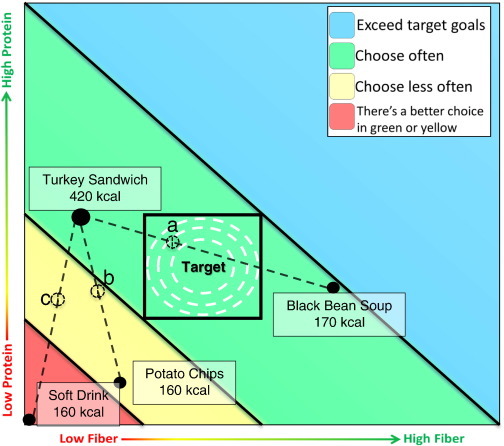 In a simple but clever experiment, researchers at the University of Illinois, tested how a graphic presentation of nutritional information could improve people’s food choices. 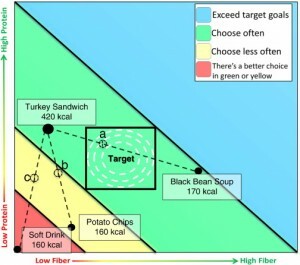 Instead of listing how much fat, carbs, protein, sugar, fibre, sodium are in your food, they mapped different foods available in the university cafeteria on a graph (similar to the one below). This presentation is simple and easy to read and the use of traffic light colours signal healthy and not so healthy options. In one overview you can see what’s good and what might not be a good choice. People who saw the graph were able to remember nutritional information better and made significant better food choices. The sale of the healthiest food went up by 43%. This experiment shows that how we present information affects how well people understand it and are able to make better choices because of it. Of course, further research is needed and perhaps they could test some different designs. All in all, we should rethink the design of food information. Now, who wants bean soup? Please consult a professional, before making significant changes to your diet.